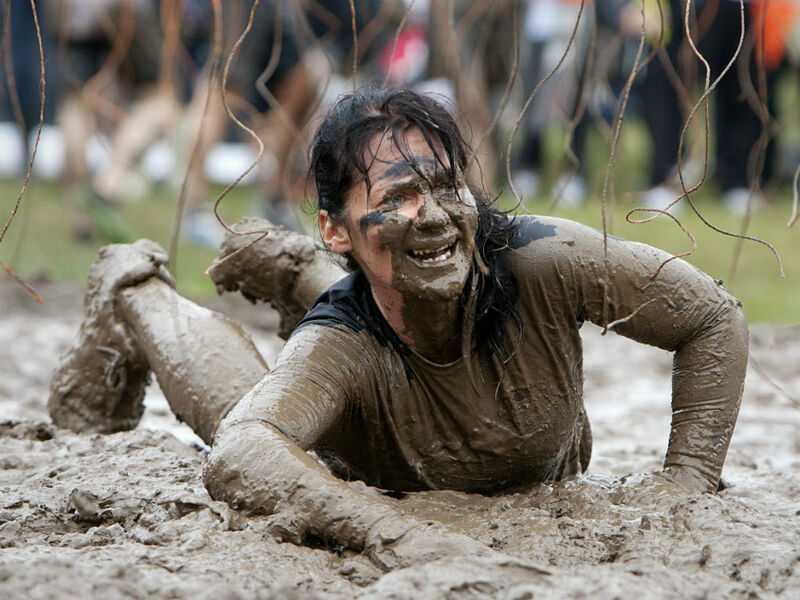 Tough Mudder, the 12 mile assault course that sits somewhere between Total Wipeout and the montage scenes in G.I Jane, is the challenge of choice if you’re looking for something that involves a lot of teamwork, monkey bars and some feel-good high fives. Set up in 2010 by US-based Brits Will Dean and Guy Livingstone, Tough Mudder has become a global fitness phenomenon, last year hosting 50 mud runs in seven different countries around the world. Thinking of participating but worried you’re not up to it? Here’s a few Tough Mudder myths you should dismiss. This depends entirely on the person in question. If you are, for example, a person who has been on three tours of Afghanistan before ticking off the Marathon de Sables (a series of six back-to-back marathons across the Sahara Desert in extreme pizza oven heat) then doing Tough Mudder will feel like a Sunday soft play session. If you’re the sort of person who last exercised under duress in 1995 and counts ‘walking to the shop to get more chocolate’ as exercise then, yes, this could well be the hardest physical thing you’ve ever done. But for the majority of you in-betweeners, Tough Mudder sees people of all shapes, sizes and levels of fitness compete, so don’t let the PR-grabbing shots of tough guys roaring their way around the course put you off. Unlike other physical challenges – such as a marathon – Tough Mudder is touted as a ‘challenge not a race.’ The point is not to complete it in a set time; the point is teamwork, mostly because you can’t physically get over those high walls or run up those skate ramps without some supporting muscle. Arguably this means you don’t actually need months on end to train, as you would with a marathon, where you’re constantly pushing yourself to go faster and faster in a set time. This obviously doesn’t let you off the hook completely, but it means you can train yourself up in a shorter period of time – Tough Mudder themselves sanction this, and even have an ‘under a month’ training plan on their website. A few challenges on the course involve shimmying your way through confined spaces while avoiding live wires which shock you if you brush against them. These might get all the press, but if you ask this writer – who did Tough Mudder a few years ago – the shocks are a noisy distraction from the real evil of the course: the delightfully named ‘arctic enema.’ It’s not quite as bad as the name might suggest, but it’s close: a shipping container filled with ice that competitors must plunge into and duck under a row of tyres to get across. You know in Titanic when Leo says ‘water that cold, like right down there? It hits you like a thousand knives stabbing you all over your body. You can’t breathe. You can’t think. At least, not about anything but the pain’ – well, that. The heart-warming thing about Tough Mudder is how friendly and helpful everyone is. And frankly, without wishing to set back the cause of feminism by about six centuries, people are particularly helpful if you’re female. Since many of the obstacles require upper body strength that most women have naturally less of, the whole atmosphere is surprisingly chivalrous. Tough Mudder should totally run a singles special. Unless you want it to get ruined. The only real essentials are quick-dry fabrics (cotton is always a bad idea) and a pair of trainers with a decent grip. Word to the wise: be very careful when you traverse any of the long boggy challenges. The mud has a habit of sucking your shoes off, and if you lose those you’re definitely out of the game. The redesigned obstacle means contestants now have to transfer themselves, not just along traditional monkey bars, but via a series of revolving wheels. This is bad enough when you have to slide in on your back. Now the entry to the tank of ice will be head first through a dark tube. OUCH. Estimated difficulty rating: Technically not so difficult. VERY painful. Attempting to climb UP a vertical tube with water cascading down on top of you will be preceded by a steel-fence-topped trench that Legionnaires (people who have done TM before) must float along on their back with only a few inches of breathing space. We don’t recommend this if you’re claustrophobic. Estimated difficulty rating: Pretty difficult. If you’ve done Tough Mudder before you can finish in style by swinging between floating rings 30 ft up in the air. Estimated difficulty rating: Difficult – not least because it’s at the end.